Naples Daily NewsThe Naples Daily News is asking residents how they voted at polling precincts Tuesday in Collier and south Lee counties. Pat Kelly of San Carlos Park couldn't bring himself to vote for either of the two major party presidential candidates. Instead, he wrote in Vermont Senator Bernie Sanders, whose presidential campaign earlier this year inspired many Democratic voters. Kelly, 49, said Sanders "seems like he's honest." And he doesn't consider his vote a protest. Sanders could win, Kelly said. "How many other people are going to write him in?" Kelly said. "It's pretty much evil versus evil," Kelly said of the race between Hillary Clinton and Donald Trump. "I don't want to vote for the lesser of two evils." Kelly also voted against Amendment 1, the solar power initiative, saying it was deceptively worded by the energy lobby. "I do enjoy the solar, but the way it's worded it doesn't protect us. It doesn't protect our rights," he said. "It gives them more power to deny us." The line outside Vanderbilt Presbyterian Church slowed to a trickle around 9 a.m., as people parked and moved in and out of the polling station with efficiency. Next door, construction workers hammered and drilled like they would on any other day. Poll workers said they had as many as 300 voters pass through in the early morning hours. "A civil, efficient group," one noted. Diane Sweet, 55, seemed more passionate about a marijuana legalization bill, Amendment Two on the ballot, than she did the two presidential candidates. "My husband recently died of cancer," the North Naples resident said, recalling his final months of struggling with chemo symptoms without medicinal marijuana. "So we just had to go out and get it ourselves," Sweet added. "And we're not even pot smokers." She said legalizing marijuana would also likely help curb prescription painkiller addiction, which has in recent years swept through the country claiming overdose regularly in cities and across suburbia. John Marshall, 68, walked out of the polling station and through the parking lot at a brisk clip, coffee cup in hand. "Oh, I went Trump," he said without hesitation. "I voted for the possibility of change in Washington." But he wants to see consistency here in Florida with a Republican Senator. "I want to maintain how it is," Marshall explained before jumping into his car. This is the 15th presidential election for Gene Rewitzer, 81, of San Carlos Park. He voted for Donald Trump, calling the Republican an outsider that "we need again." "I think this election cycle has been very revealing in that it exposed the elite or the professional politicians, and it exposed their agenda," he said. That agenda is bigger government, which he believes is really the agenda of the Democratic and Republican parties: "Both of them," Rewitzer said. Poll workers said more than 100 people were waiting to vote when the doors opened at Max Hasse Jr. Community Park in Golden Gate Estates. Exit polling results showed Donald Trump and Marco Rubio trouncing their Democratic opponents in voting at the Golden Gate Estates precinct. Jenny McCallion, 66, cast a vote for Trump but said she is resigned to a Clinton victory. "I just don't trust Hillary Clinton and the whole Clinton machine," she said. 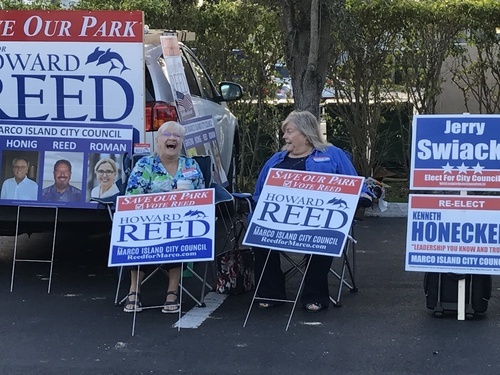 (Left to right): Debra Reed, 64, wife of Marco Island City Council candidate Howard Reed, laughs while campaigning with Pat Molloy, 67, outside of Precinct 190 on Election Day, Tuesday, Nov. 8. Molloy, who voted for Clinton, said she used to be afraid to express her political views on Marco Island because it's predominately Republican.